Welcome to another edition of Battle of the Songs. For this edition, I was debating to do one or two topics: either about Eurovision or Japanese songs. It looks like that this week is about Japanese songs as you can see Sunday’s and Monday’s post were both about Japanese songs. But, I am going to save the Japanese songs battles for May as it will be the first month of the new era in the Japanese calendar. So for this battle, I want to do a song that was performed by past Eurovision winner as you know Eurovision is next month! )If you haven’t read my series about this year’s entries, you can find in these parts: Part I, Part II, Part III, Part IV, Part V, and Part VI.) The song itself was never presented at Eurovision, but the group has. And, everybody knows this group as they are world famous. There have been a musical and two films that featured their songs. Which group am I talking about? Part six of the Eurovision series! I can’t believe that in about month’s time, this amazing competition will happen! This post will feature artists and songs from these three countries three countries: Greece, San Marino, and Armenia. If you haven’t check it out already, please check out Part I , Part II , Part III, Part IV, and Part V of the series. Those three blog posts feature songs from the Czech Republic, Hungary, Montenegro, Belarus, Cyprus, Finland, Serbia, Poland, Slovenia, Australia, Belgium, Estonia, and Iceland, Georgia, and Portugal. Its the end of September! We saw the transition of a hot, sticky summer to the cold, rainy autumn — well, at least in Japan! This September was a magical month as I achieved all my goals and created new outlets for my content. Music Reactions: Boogie Woogie with AKB48, coming Halloween 2015! It is never too early to start Halloween, right? I remember that recently in America, Halloween products have started to show up around the end of July or early August along with back to school supplies. 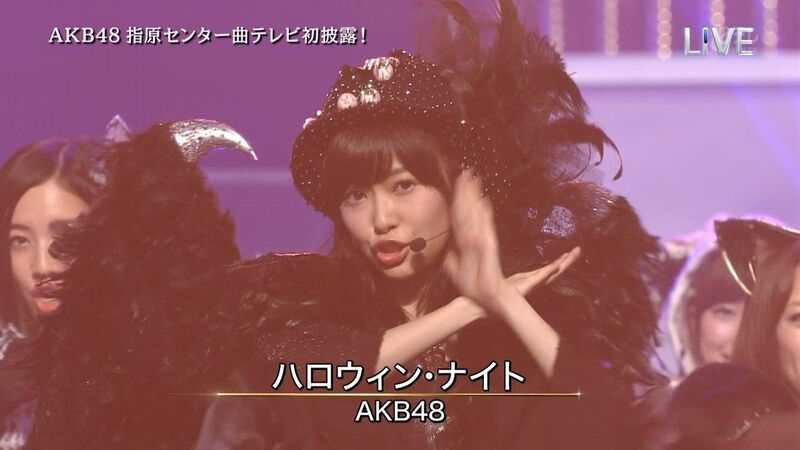 Apparently AKB48 wanted everyone to get in the Halloween mood early like Americans by performing their new song “Halloween Night” on a special music program last night. I always had a love/hate relationship with AKB48. Ever since their debut with “Sakura no Hanabiratachi” in 2006, I have said that I hated this super idol group because of various reasons. I, like many fans, have compared AKB48 with my favorite group Morning Musume. a lot and said I could only be a fan of one group. I really loved the girls in Morning Musume. and thought they were more talented (in terms of singing, personality, dancing, cuteness, and others) than AKB48. I still listened to the 48 family as I downloaded some of their more popular singles. Over time, my hard heart soften as I began to like some of their songs like “Koisuru Fortune Cookie”, “RIVER” (which had my former favorite member Tomomi Itano), and “Dear my teacher” (What can I say? I am attracted to Akimoto Yasushi’s weird lyrics somehow). “Halloween Night” features one of my favorite members Rino Sashihara. I think I like her a lot because she is a huge fan of other idol groups, especially Hello! Project, and wants to create harmony and love between groups unlike some fans out there who want to start the “whose is better” wars. Furthermore, I think I might start to like Minami Takahashi, gorgeous Yuki Kashiwagi, Sakura Miyawaki, and unique Sayaka Yamamoto after watching yesterday’s live performance because they had the best costumes and performance style. According to this tweet, this new song is supposed to be a sequel to the 2013 mega popular hit “Koisuru Fortune Cookie”. Both songs feature Rino as lead singer (as she won the fan’s hearts in the AKB fan elections this year and in 2013) and a 70s-style disco sound. Heck, when I first listened to “Halloween Night”, I wrote on my Facebook that “the 1970s just called and wants its disco music back, Japan”. You can hear it from the high-pitched guitar scale runs in the introductions, the musical break with the chorus, and the chopped rhythms. The song reminds me a lot of Earth, Wind, and Fire and/or Donna Summers while the musical break’s backup chorus reminds me of 90’s Jpop. Many fans on the internet think that “Halloween Night” reminds them of the song “Boku no Sensei wa Fever” from the 70s drama “Necchuu Jidai”. I could hear a bit of a resemblance as both songs shared the same rhythms in the first few measures. However, after that, “Boku no Sensei wa Fever” and “Halloween Night” are totally different songs with different melodies. “Boku no Sensei wa Fever” is more of a disco song with Japanese melodies incorporated in it. I feel like “Halloween Night” is an American disco song with whoever composed the song getting inspired more by Earth, Wind, and Fire. Do you remember what you were doing that day? Do you recall what you bought? Did you, by any chance, buy Teri DeSario’s new album “Overnight Success”? Probably not, if you lived in any part of the world that’s not Japan, as the album and its tie-in singles were only released there. However, you might have heard of Teri DeSario as she is no stranger to the American music scene. In the late 1970s, she was popular at many dance clubs when her disco-themed debut album “Pleasure Train” was released. The first single from the album, “Ain’t Nothing Gonna Keep Me from You”, was a minor hit as it reached #77 on the US charts. “Pleasure Train” also marked the start of a long-standing musical relationship between DeSario and Joey Carbone (who I mentioned earlier this month with the Bay Canyons post). A hit single came in 1980 when she released the single “Yes, I’m Ready” with K.C from the KC and the Sunshine Band. The single went to #2 on Billboard’s Top 100 chart, only being outranked by Queen’s “Crazy Little Thing Called Love”. Sadly, disco music began to fade out from the American popular music scene soon after the single was released. Her record company persuaded DeSario to adapt to more of a female rock sound and copy the likes of Pat Benatar for her third album, “Caught”. With little promotion and a genre change, “Caught” was met with poor sales, causing DeSario to bounce from one musical genre to another. When Desario started to work on her seventh studio album, she decided to go back to the genre that helped her to achieve fame; disco. Her record company knew that Japan was the place to make her a star once again. The reason was that disco didn’t really fade out from the Japanese music industry during that time, unlike in America. Instead, it kept on evolving and changing. However, the disco found in Japan during the mid-1980s wasn’t the same kind of disco that was found in the 1970s from the acts of Earth, Wind, and Fire, Donna Summers, Jackson 5, and so on. It was completely different as this type of disco came from the idea of Italo disco; which was a heavy electronic, high energy dance genre from Italy. Some famous Italo disco songs were Baltimora’s “Tarzan Boy”, Laura Branigan’s “Self Control”, and Sabrina’s “Boys” If you don’t know these songs, you can get a taste of Italo disco with this wonderful compilation on Youtube. DeSario asked Joey Carbone to help write and performed on several tracks for her new album. She also enlisted the aid of guitarist Richie Zito, who worked with artists like Toni Basil, Cheap Trick, Ratt, and others. 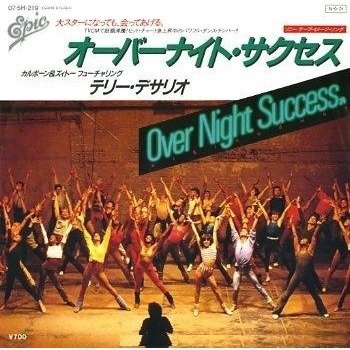 * Released on January 21, 1985, “Overnight Success” was a huge hit in Japan as it charted #48 on the yearly Oricon chart. To kick things off, the team picked the high energy, feel good title song to be the first track on the album The song starts off with an innocent crystallized keyboard sound and a solid bass drum beat for a few seconds. Then, with a small lead in, the guitar and synthesizer come roaring in to set up the song. These instruments provide the energy while DeSario’s voice and the song’s uplifting lyrics supply the raw power. The lyrics are about dealing with the struggles and the hard times that one may face while not forgetting about the dreams and determinations that one holds. Because, these are “the key to your happiness” and gives anyone the power to succeed. Yes, you might have heard these themes countless times before in other songs. But, what makes “Overnight Success” a unique song is how the lyrics are interpreted by DeSario’s way of singing. You can feel the song’s passion, determination, dreams, and strength by just listening to Teri. The music video’s story is very charming, inspiring, and even makes you experience nostalgia with that 80s fashion. Those workout outfit! Ahhh, the horror! Besides the video’s fashion, it includes this “once young” actor who is now referred to as “McDreamy” and has starred in countless TV shows and movies like “Grey’s Anatomy” and “Enchanted”. Happy 30th Anniversary, “Overnight Success”! You may be a bit outdated. But, that has never stop you to be a rare find and an excellent album to listen to. May you continue to inspire others to never give up their dreams and find their “key to happiness”. *Fun Fact for all those anime buffs out there: Joey Carbone and Richie Zito would later compose the soundtrack for the 1986 anime “Project A-Ko”. Isn’t that cool?